FREE SHIPPING! ORDERS $75 OR MORE. See Details. 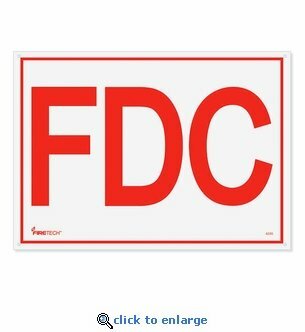 Clearly mark your fire department connection locations with these aluminum FDC Signs. These bold red and white FDC signs are silk screen printed on heavy gauge aluminum, then oven-baked for extra durability. The metal signs feature pre-drilled mounting holes, rounded corners and smooth finished edges. Perfect for mounting on block or concrete walls. For small quantity orders select USPS Priority Mail for best shipping rate. 4 or more qualify for Free Shipping. FREE SHIPPING on orders $75.00 or more. 4 Year Metal Fire Extinguisher Monthly Inspection Tag - 2 1/4" x 3"
25 - Monthly Inspection Tag - Peel n Stick Labels - 2" x 3"
Plastic Fire Extinguisher Monthly Inspection Tag - Yellow - 2 3/8" x 4 1/4"
Fire Extinguisher Monthly Inspection Tags - 2 5/8" x 5 1/4"
Click the envelope to subscribe. Copyright © 2019 Fire Supply Depot. All Rights Reserved.